Two leaks in Amsterdam Hall have caused water to drip into students' rooms. Officials are addressing two leaks in Amsterdam Hall that have been dripping water into residents’ rooms. 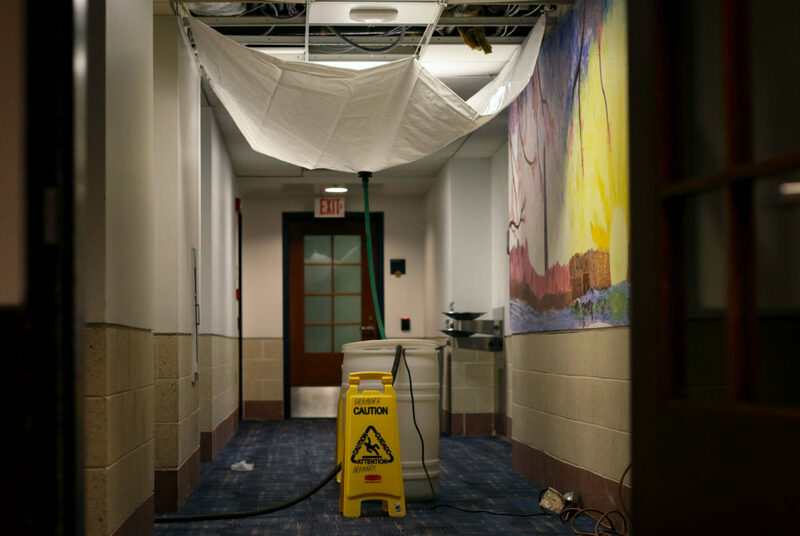 University spokeswoman Maralee Csellar said one of the leaks on the first floor began on the roof, but repairs have been delayed because of recent rain. The second leak, she said, stemmed from a clogged HVAC drain line. Work to repair the leaks and clean the affected rooms is “currently in process,” she said. “We are hoping for a break in the weather next week so that the roofing contractor can identify the origination point of the water, as repairs cannot be completed in wet conditions,” she said in an email. She said property management and housekeeping personnel are cleaning residents’ rooms and providing temporary solutions while the University works on repairs. Once a repair has been made, the University continues to work with the residents to fix any remaining damage, Csellar said. “When a student reports an issue within their room, the University assesses the situation and then seeks to identify the source of the problem,” Csellar said. Students who have water-related damage are encouraged to report the problems to FixIt, Csellar said. “We also thank the residents who we are currently working with for their patience as we work to resolve these issues,” she said. Csellar declined to say how many rooms have been affected by the leaks. Nikolai Bottitta, a junior who lives on the second floor of Amsterdam, said the walls of the kitchen closet began to leak water about two weeks ago. “The walls were damp and the paint was loose, and you could clearly tell there was water running through the wall,” he said.